Southern corn rootworm larva. The head is to the left with the legs visible on the first three segments behind the head. Rootworm larvae have a dark spot on their last abdominal segment. This can be seen on the right side of the insect pictured here. Conditions continue to be favorable for southern corn rootworm (SCR) development across much of Georgia’s 2018 peanut acreage. SCR is a pest that requires moist soil conditions, and we typically see rootworm infestations in fields with heavy soils and center pivot irrigation. The abundant rainfall in many areas this year means that we could see SCR in non-irrigated fields especially in low spots with heavier soil texture. I traveled to UGA’s Southwest Georgia Research and Education Center in Plains yesterday to check on peanuts planted for a SCR management trial. The peanuts are 55 days old, and the vines are lapping the row middles and putting down pegs. I pulled a dozen plants at random in the field, and all of them had rootworm damaged pods. The injured pods ranged from match head to nearly full size, and the injury was difficult to see prior to rinsing off the wet, red clay. Even with the small sample size and without trying very hard, I collected 5 rootworm larvae and one wireworm larva (see images). 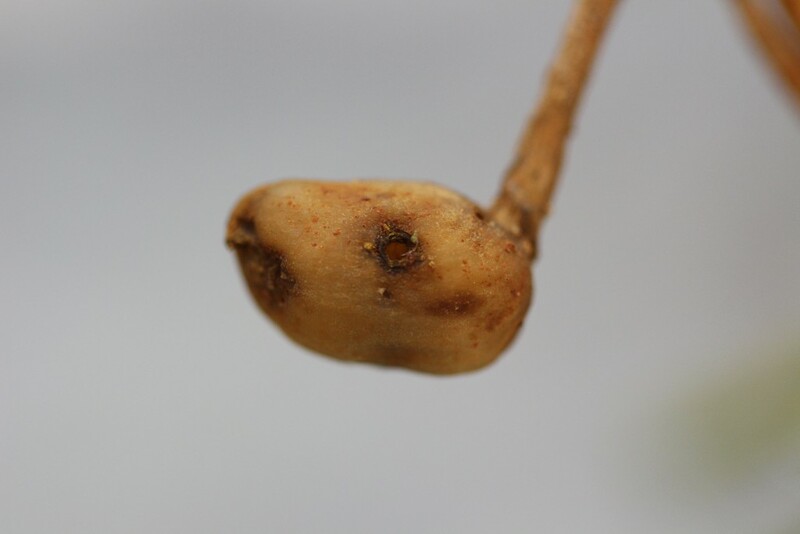 Rootworm injured peanut pod. The discoloration seen around the feeding holes developed overnight after the pod was stored in a refrigerator. blame the lower than expected yield on some other factor like “it was too cloudy or too cool or too wet” all the while the answer was that there were too many rootworms. Unfortunately, rootworm management options are limited. Granular chlorpyrifos banded over the row is the only treatment proven to be effective against this pest in peanut. Most of the research on SCR was done in Virginia and North Carolina, and studies there indicate that preventative insecticide applications made before infestations are establish provide the best control. There are currently no foliar insecticide treatments recommended for SCR management, and targeting the adult beetle has not been shown to reduce injury or improve yields. SCR in Georgia can accurately be described as a sporadic pest, and most fields will either not have rootworms or have too few to be of economic importance. This is true even in a year like 2018 when conditions are right for infestations to develop. Growers with high risk fields (those with a history of SRC infestations) should consider the pros and cons of applying granular chlorpyrifos. Everyone else should be monitoring the crop to detect rootworms early in case infestations develop. You can scout for SCR by pulling up plants and examining the roots and pods for feeding injury and sifting through the loose soil to find the larvae. Your local UGA County Extension agent can provide more information about southern corn rootworm and other insect pests of peanut. 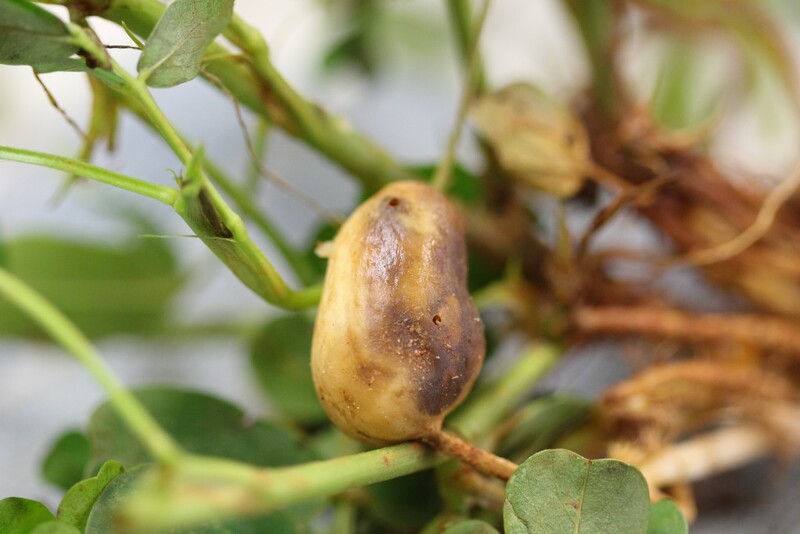 Young peanut pod with rootworm injury. 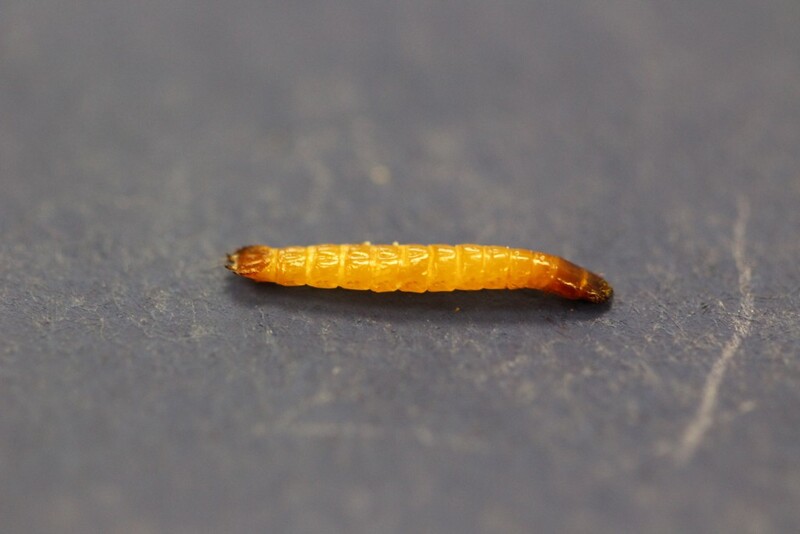 Wireworm larva. Though somewhat similar to rootworm larvae in appearance, wireworms are more heavily sclerotized (harder and darker) than rootworms. The last abdominal segment of wireworms (seen to the left in this picture) often has hairs, spines and/or ridges. Posted in Rootworm, Uncategorized. Bookmark the permalink. Previous: 27 July Peanut Insect Update: Potato leaf hoppers etc.